Miami, Fla and Singapore, Oct 10, 2014 - (ACN Newswire) - Discovery Kids Latin America, the leading preschool pay TV network among kids 4-11 and the #1 pay TV network among W25-49 pan-regionally, announced today that they have acquired the format for the award winning children's television series, Hi-5. In this two-part deal, Discovery Kids Latin America looks to expand on the skyrocketing popularity of the Hi-5 series by offering new seasons of the Australian version and developing a localized Spanish and Portuguese version with regional cast members from Brazil, Mexico, Colombia and Argentina. "Hi-5 is a remarkable brand and a perfect fit for Discovery Kids Latin America. With its enormous success worldwide, we are confident that our young viewers will be empowered, stimulated, entertained, and continue to be captivated with Hi-5," said Carolina Lightcap, Head of Content for Discovery Latin America/US Hispanic (DLA/USH). "We're delighted to be taking the show one step further by producing a local version especially for our markets." "Hi-5 has universal themes such as exploration, friendship, creativity, and learning. These qualities make the show accessible to almost any culture", says Jared Lim, Chairman of Hi-5 World. "Through localization, many more opportunities for growth and expansion in the Latin American region will arise, which we are really excited about." Additionally, Discovery Kids Latin America, part of the DLA/USH portfolio of networks, acquired the exclusive PayTV and digital rights to the brand new Hi-5 Series 14 and 15 , which will begin to air in November of this year. Hi-5 Operations Pte. Ltd., and DLA/USH concluded the deal with the assistance of leading international sales and distribution company Comarex. Marcel Vinay Jr, CEO of Comarex added, "In today's media savvy world, Hi-5 is a show with positivity and fun at its core and is an ideal platform to engage preschoolers. We are thrilled to have worked alongside Hi-5 World to secure this award winning series for Discovery Kids Latin America and its young audience." Discovery Networks Latin America/U.S. Hispanic (DLA/USH) is a division of Discovery Communications (Nasdaq: DISCA, DISCB, DISCK), the world's number-one non-fiction media company reaching more than 2.5 billion cumulative subscribers in more than 220 countries and territories. Discovery is dedicated to satisfying curiosity, engaging and entertaining viewers with high-quality content on more than 200 worldwide television networks, led by Discovery Channel, TLC, Animal Planet, Investigation Discovery and Science, as well as U.S. joint venture network OWN: Oprah Winfrey Network. Discovery also is a leading provider of educational products and services to schools, including an award-winning series of K-12 digital textbooks, and a digital leader with a diversified online portfolio, including Discovery Digital Networks. In Latin America, the educational initiative Discovery en la Escuela empowers teachers with rich content to improve students' achievements. DLA/USH distributes 11 networks that reach more than 318 million cumulative subscribers in 49 countries and territories, including Discovery Channel, Discovery Kids, Animal Planet, Investigation Discovery, TLC, Discovery Home & Health, Discovery Civilization, Discovery Science, Discovery Turbo, Discovery HD Theater and TLC HD as well as high definition versions Discovery Home & Health HD, Investigation Discovery HD, Discovery Channel HD and Discovery Kids HD. In the United States, DLA/USH also operates two U.S. Hispanic brands for Spanish-speaking audiences, Discovery en Espanol and Discovery Familia, both fully distributed on U.S. Hispanic tiers. For more information, please visit www.discovery.com. Hi-5, the children's musical group was launched in Australia in 1999 with five dynamic performers entertaining children aged 2-7 with music, movement, problem solving and play. Well known globally, they have reached an estimated global audience of more than 10,000,000 children across North America, Europe, Australasia, Asia, and Latin America with its tours, music, and TV shows. Captivating children between two and seven years old with over 14 successful series to date. Each series has gentle educational themes focusing on music, positivity, and imaginative play where kids are taught values such as love, fun, adventure, social interaction, healthy living, and developmental growth. 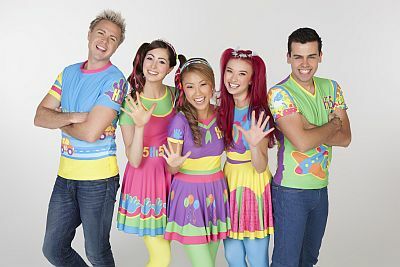 Hi-5 has won three Logie Awards for Most Outstanding Children's Program, five ARIA Awards for Best Children's Album, five Australian DVD and Video Industry Awards an APRA Award, an AMIA Award and a Helpman Award. For more information, please visit www.hi-5world.com. Comarex is a leading international distributor of Hispanic media and programming including digital content distribution and distributes more than 42,000 hours annually in over 110 countries. Comarex's catalogue is composed of a wide selection of genres including telenovelas, feature films, documentaries, game-shows, sports, children's programming, news, music entertainment, series, reality shows and mobile content. In addition to its content library Comarex is the exclusive sales agent for various production companies including Azteca (worldwide) and in Latin America and Hispanic USA to Studio 100 Media, MTV Networks, Mediaset Distribution and Dicon Media, as well as HBOLA in Eastern Europe, Asia and Africa. For more information, please visit https://comarex.tv.